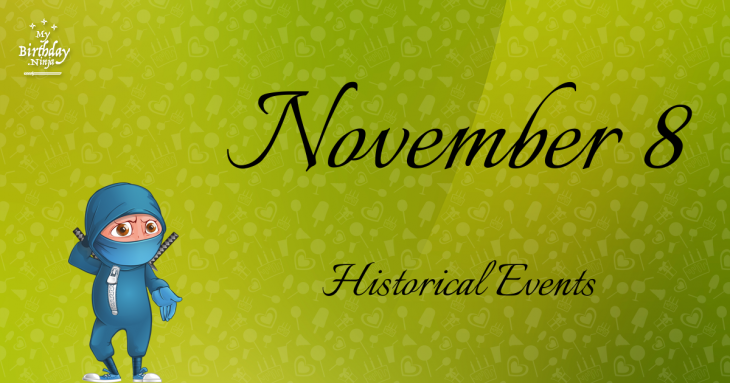 The following events took place on November 8. The list is arranged in chronological order. Battle of Andrassos: Byzantines under Leo Phokas the Younger score a crushing victory over the Hamdanid Emir of Aleppo, Sayf al-Dawla. Robert Catesby, ringleader of the Gunpowder Plotters, is killed. Montana is admitted as the 41st U.S. state. The People’s Commissars give authority to Vladimir Lenin, Leon Trotsky, and Joseph Stalin. Greco-Italian War: The Italian invasion of Greece fails as outnumbered Greek units repulse the Italians in the Battle of Elaia–Kalamas. World War II: French resistance coup in Algiers, in which 400 civilian French patriots neutralize Vichyist XIXth Army Corps after 15 hours of fighting, and arrest several Vichyst generals, allowing the immediate success of Operation Torch in Algiers. Korean War: United States Air Force Lt. Russell J. Brown, while piloting an F-80 Shooting Star, shoots down two North Korean MiG-15s in the first jet aircraft-to-jet aircraft dogfight in history.